Detail the import methodology in Democratic Republic of the Congo. How to import to Democratic Republic of the Congo? Explain about import registration process, cargo movement to Democratic Republic of the Congo from overseas countries, Import delivery process in Democratic Republic of the Congo etc. What are the import procedures in Democratic Republic of the Congo to move goods? 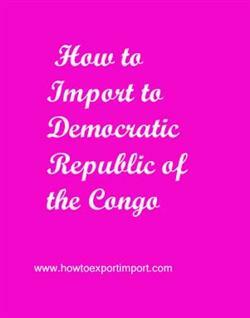 This post explains about step by step procedures that need to be finished with Democratic Republic of the Congo government authority for importation to Democratic Republic of the Congo. All natural persons or legal entities are approved to conduct export and import process in Democratic Republic of the Congo (DRC). For business purpose, a registered trade with concerned license (if required) as per the business and have enlisted in the Trade and Company Register of the country is must for exporting and importing of products from and to Democratic Republic of the Congo (DRC). The Directorate General of Customs and Excise(DGDA) of Democratic Republic of the Congo (DRC)is assigned with execution of all the decrees issued by the nation’s ministerial authorities and governmental institutions which concerned, collecting duties, controls illegal trade, prevention of smuggling and is facilitator of genuine trade. The import documents required in Democratic Republic of the Congo (DRC) depends up on the regular trade policy of Democratic Republic of the Congo (DRC) Government, the nature of goods importing, specific goods importing to Democratic Republic of the Congo (DRC). In many cases, the documentation may also vary depending on the country of origin or destination. The documents may have to be prepared in a special way to comply with the requirements of the import or export country. The documents required for import to Democratic Republic of the Congo (DRC) to take delivery of import cargo is also based on the product importing, multilateral, bilateral or unilateral trade agreements, and other trade policies of Democratic Republic of the Congo (DRC) government. This post explains about different phases in import process that every importer needs to go through in Democratic Republic of the Congo. How to import to SAN JOSE? Formalities for import to PUNTARENAS. Procedures to import to PUERTO LIMON. Need to import to POINTE NOIRE. Explain to import to Kisangani. Information to import to Kisangani. Step by step process to import to Kisangani. Help to import to. Procedures required to import to PUERTO CALDERA. Requirements to import to Kisangani. Clarifications to import to Lubumbashi. How can I import to Kisangani. What should I do to import to PUERTO LIMON. Methods to import to COSTA RICA. Guidelines to import to Kinshasai Please guide to import to Kisangani. How to Import to Republic of the Congo? Three Mandatory documents required to export goods from India.